Every year the “Peace and Sport” organization award several prizes to those who use sports to foster citizenship, peace, respect and tolerance . "Peace and Sport, L'Organisation pour la Paix par le Sport" is an international, neutral and apolitical initiative under the High Patronage of H.S.H. Prince Albert II of Monaco (in France). Peace and Sport was founded by Joel Bouzou, current President of the organisation. Joel Bouzou is an Olympic medallist, world champion of Modern Pentathlon and current Secretary General for the International Union of Modern Pentathlon (UIPM). He is also Advisor to H.S.H. Prince Albert II of Monaco. This year one of the awards is going to Skateistan, a skateboarding organization founded in 2007 by a group of Aussie skateboarders. The group started in Afghanistan and has a history of using skateboarding as a tool for bringing about social change. Skateistan is receiving the Peace and Sport Image of the Year Award for a photo snapped in Kabul during this year's Go Skateboarding Day. The photo was selected out of all the entries received because it aptly displays how skateboarding has affected the youth living in war torn Afghanistan. It shows children from various backgrounds enthusiastically skating together through the city streets as one. Members from Skateistan will officially receive the award in the presence of 500 international leaders, including H.S.H. Prince Albert II of Monaco. It is not the first time that Skateistan has received such an award from the group. In 2009 the organization was the recipient of the Peace and Sport Award for Non Governmental Organization for Peace. The recent photo award isn't all Skateistan has had to celebrate as of late. 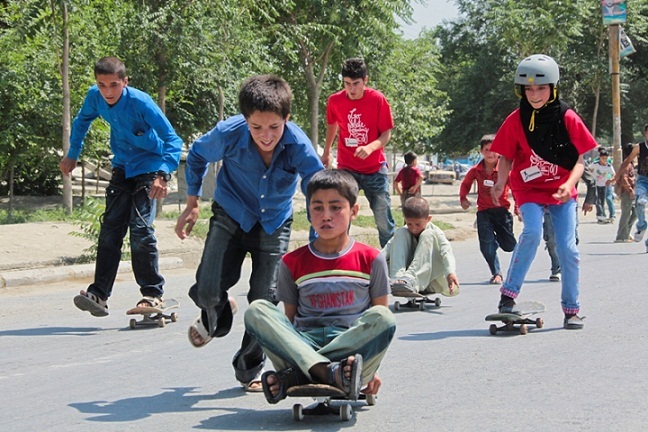 The organization also received funding in late September for its newest venture, a skatepark and facility in Mazar-e-Sarif. With funding issues resolved, the organization is hoping to have the Mazar-e-Sarif facility completed by spring 2012. In addition to the facilities in Kabul and Mazar-e-Sharif, the group also has operations in Cambodia. The award will be presented during the Peace and Sport International Forum slated to take place on October 27, 2011.